Beginning in 1887, the federal government attempted to “Americanize” Native Americans, largely through the education of Native youth. 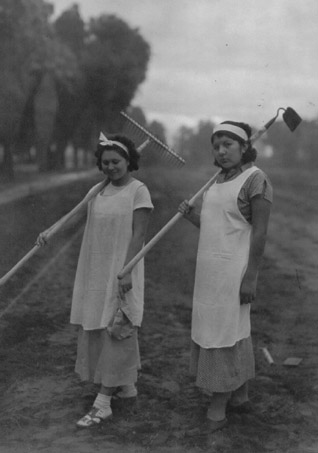 By 1900 thousands of Native Americans were studying at almost 150 boarding schools around the United States. The U.S. Training and Industrial School founded in 1879 at Carlisle Barracks, Pennsylvania, was the model for most of these schools. Boarding schools like Carlisle provided vocational and manual training and sought to systematically strip away tribal culture. They insisted that students drop their Indian names, forbade the speaking of native languages, and cut off their long hair. Not surprisingly, such schools often met fierce resistance from Native American parents and youth. But some Indian young people responded positively, or at least ambivalently, to the boarding schools, and the schools also fostered a sense of shared Indian identity that transcended tribal boundaries. One of those schools was in Riverside California and is the subject of a new book from scholars aUniversity of California, Riverside. Following is a news feature highlighting the book and the research being conducted at the university. 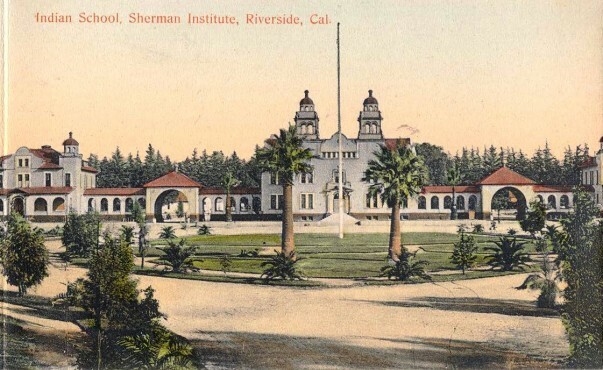 At Sherman Institute in Riverside, Calif. — the flagship among 25 federal off-reservation American Indian boarding schools — students who could no longer speak their native languages became alienated from their communities. Others, however, assumed leadership positions when they returned home and helped their tribes bridge the gap between Native American and mainstream American societies. 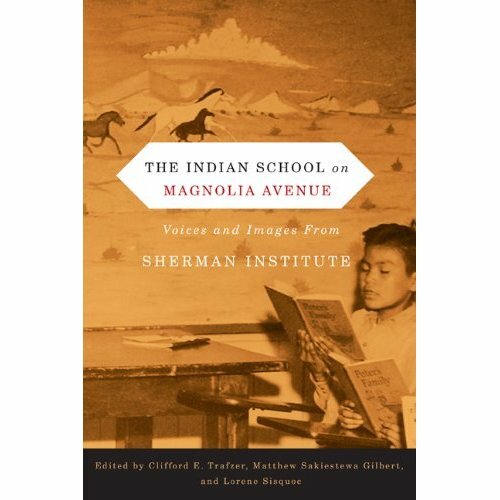 The Indian School on Magnolia Avenue: Voices and Images from Sherman Institute, written and edited by historians connected to the University of California, Riverside, recalls those experiences through the voices of Sherman students and photographs from the school’s extensive archives. Published this month by Oregon State University Press, the book is the first collection of writings and images about an off-reservation Indian boarding school. For much of its history Sherman enrolled children as young as 10, until 1970 when it became a fully accredited high school. Today, Sherman Indian High School is controlled by Native Americans with a curriculum that includes American Indian history, languages and cultures. Sherman Institute enrolled its first students on Sept. 9, 1902, a decade after its predecessor, the Perris Indian School, was founded in an agricultural region south of Riverside. Harwood Hall, Sherman’s first superintendent, lobbied to move the school from rural Perris to the larger community of Riverside, where entrepreneur Frank Miller wanted Indian students to work at his Glenwood Inn, later renamed the Mission Inn. Tourists would ride the trolley from the inn to the Magnolia Avenue school, “visit the Indians, then go next door to the zoo,” Trafzer said. The book was written by Trafzer, UCR alumni and current Ph.D. students in American or Native American history, and Lorene Sisquoc, curator of the Sherman Indian Museum, where UCR graduate students have spent countless hours conducting research in the archives. Sisquoc also is a UCR master’s degree site supervisor. 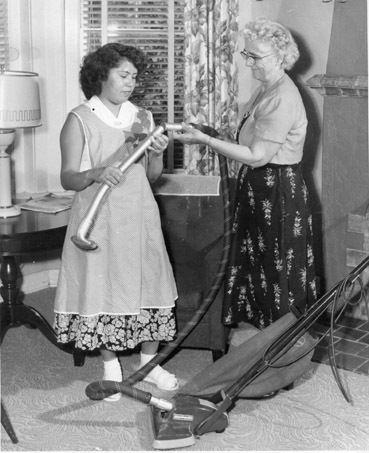 “Without Lorene Sisquoc, this book wouldn’t have happened,” Trafzer said, adding that the relationship between public history graduate students at UCR and the Sherman museum began in the 1990s when Ph.D. candidate Jean Keller volunteered as a museum intern. Keller’s dissertation and resulting book, “Empty Beds: Indian Student Health at Sherman Institute, 1902-1922,” were the first written about Sherman Institute. Her research on the Sherman nursing program and the impact of public health education on Sherman students is the subject of one chapter in the book. Other chapters focus on the role that Mission-style architecture played in the life of the school and its students, Sherman students as patriotic Indians, vocational training and the “outing” work program, the Special Navajo Five Year Program, the school cemetery, and the extensive photographic record in the Sherman vault that numbers more than 10,000 images. Grants from the Rupert Costo Endowment at UC Riverside and the UCR Academic Senate funded some research expenses associated with the book. “The Indian School on Magnolia Avenue” is part of First Peoples: New Directions in Indigenous Studies, a Mellon Foundation-funded initiative that supports Oregon State University Press’s publication of Native American scholarly titles with a special focus on collaborative and community-based research. Proceeds from the sale of the book will go to the Sherman Indian Museum. The Indian School on Magnolia Avenue was co-edited by Trafzer, Sisquoc and Gilbert, an assistant professor of American Indian studies and history at the University of Illinois at Urbana-Champaign (M.A. and Ph.D., UCR). Co-authors are: Gilbert; Sisquoc; Trafzer; Keller, adjunct professor of American Indian studies at Palomar College (M.A. and Ph.D., UCR); Jon Ille, who is completing his Ph.D at UCR. ; Robert McCoy, associate professor of history at Washington State University (Ph.D., UCR); Michelle Lorimer, who is completing her Ph.D. at UCR; Leleua Loupe, who teaches American history at several colleges (B.A., M.A. and Ph.D., UCR); William O. Medina, adjunct professor of American history at Riverside Community College and San Bernardino Valley College (Ph.D., UCR); Kevin Whalen, who is completing his Ph.D. at UCR; and Shaina Wright, a Ph.D. student at UCR. 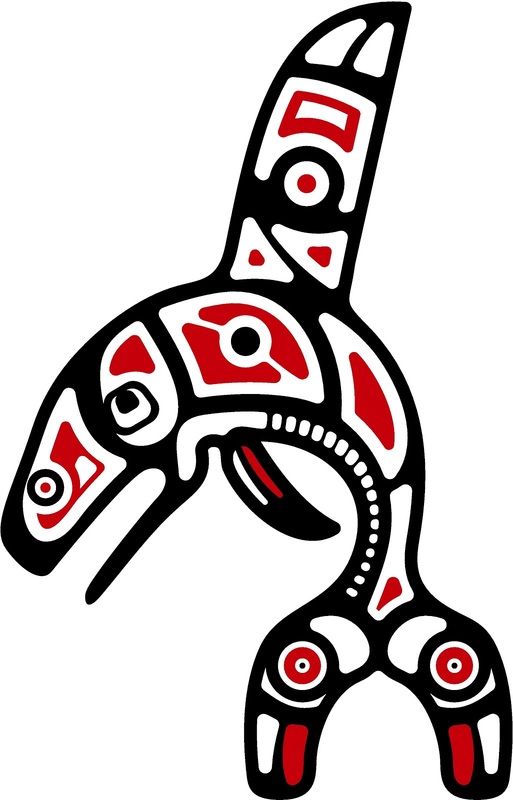 Note: My latest novel Adrift in the Sound includes Native American themes and characters from the Pacific Northwest, incorporating extensive research into the Lummi Nation, whose people lived on Orcas Island, part of the San Juan archipelago off the north coast of Washington State, which is the setting for much of the book.